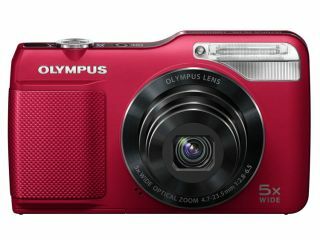 Olympus has announced five new compact cameras to sit in its line-up, including a rugged "Tough" camera. Here's a rundown of all the new cameras that have been announced, along with expected prices and availability. First up is the Olympus VG-170, which claims to have the best flash of any camera of its type, covering twice the range. Faces and objects up to a full 15 metres away can be illuminated, while in Long Flash Mode it will automatically adjust ISO sensitivity to make sure the camera is set up correctly for low light. Also on board the camera is a 14 million pixel sensor, 5x wide angle optical zoom lens and a 3 inch LCD screen. A host of automatic aids, such as i-Auto, Face Detection and AF tracking also included, while full HD video recording is also available. Nine fun Magic Filter effects are included, while the camera is also compatible with wireless Eye-Fi cards. The Olympus VG-170 UK price will be around £99.99, and will be available in shops from the middle of February. Next up is the V4-340, which comes equipped with a 10x wide-angle optical zoom lens and a 16 million pixel sensor and high ISO capabilities. HD video recording at 720p is available, along with dual image stabilisation for reducing blur. Automatic aids, including iAuto, are also available on the VR-340, while automatic scene mode can also be applied. The Olympus VR-340 UK price will be around £129.99 and will be available from late February. The latest Olympus superzoom comes in the form of the 24x optical zoom SZ-14. Other key technologies include Multi-motion Movie IS, which complements the HD video recording capability by reducing blur. A range of magic filters are of course included, this time featuring 11 including the new Fragmented filter. The SZ-14 also features a new Telephoto Macro function, which allows the photographer to get right-up close for macro shots, including the texture and detail of small subjects from just 30cm away. Available from mid-February, the Olympus SZ-14 UK price is set to be around £199.99. The next camera is the 12.5x optical zoom SH21, which also features a 16 million pixel Backlit CMOS sensor with high sensitivity, especially designed for dimly lit situations. Full HD (1080p) video recording is available, with the camera also equipped with the Multi-Motion IS to help reduce camera shake, even when the user is moving. Live Guide is included to show in real time how fine tuning key settings can make a picture. Touch Autofocus tracks moving objects you tap on the LCD, while Touch Shutter activates the shutter release. Finally, the latest Olympus tough camera has been introduced. The TG-320 is shockproof, waterproof and freezeproof, and is, according to Olympus, "virtually indestructible." What that actually translates to is drop-proof from 1.5 metres, waterproof down to three metres and freezeproof down to -10 degrees celcius. A system of double seals protects the inner casing, while a double lock mechanism means that unintentionally opening the card slots is made difficult. It also features a 14 million pixel sensor and HD video recording capability. The 3.6x wide angle optical zoom lens is protected by a special hard glass barrier to protect against damage. Dual IS is included to help reduce blur in poor light and with fast moving subjects. Intelligent Auto Mode and AF tracking are also included. Creative features include 3D underwater photo shooting and Magic Filters, which is also available when recording video. The Olympus TOUGH TG-320 UK price is £139.99 and it will be available from mid-February.